This page will cover the blocks you will find in the Common Palette, which is for beginners and intermediate Mindstorms programmers. This palette is the base of Mindstorms programming, anything you need for a successful program is in here. We suggest that, before moving onto the higher level palettes, you master using the Common Palette and all of its blocks. 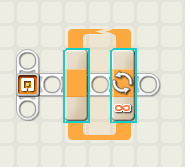 This block will be the most common block which we will be using in our general programming; it can control one or more motors and is used as the basis for most programs because it simplifies maneuvers such as reverses and turns. Using the configuration panel we can modify the block to satisfy our needs. For this programming, go to the Motor Chapter Base! This block adds a cool personalized look, or should I say, SOUND, to your robot; it has over 60 different sound file options and an infinite amount of personalized phrases. The possibilities are endless! The Sound Block doesn't really help your actual program, it only makes it look cool. Be careful when trying to use it at competition, it could waste precious seconds during your run. We suggest using it on your last program of your run, to end with an ice cool finish! The display block allows us to "display" an image on the screen of our NXT Brain; the Display Block configuration panel shows that we can display shapes, text, or even a user made drawing! If you don't want the same picture to be running the entire program, then add another Display Block and from the drop-down menu, select reset. This block lets you record an action that you act out with your robot. It does this by remembering how many times the motors turn on your robot and then replaying the correct number of turns when you select "run" on your Record/Play block and run your program. For example, you can have the Record/Play block record the motion as you roll a wheeled robot forward and then turn it sharply to the left. When you run these recorded motions using a Record/Play block, the wheeled robot will go forward and turn without your help. The bottom right icon displays if it is recording or playing. Wait... Wait for it... The Wait Block is like a bomb just waiting to go off! This block pauses the program for a length of time or waits until another block or sensor input triggers a function! In the picture, the Wait Block has the sensor input of Touch Sensor - pressed. This means it will not carry out a function until the Touch Sensor button is pressed. To program this, go to Touch Sensor Programming! The loop is a classic programming tricks! The Loop Block causes a sequence of blocks placed inside of it to repeat until an event which we program stops it or when we end the program using the NXT Buttons. Using the Loop Block we can simplify or shorten the length of a program because the same blocks are run over and over again until we tell it to stop. Just loop it! For programs where we use the loop go to Light Sensor Programming or Color Sensor Programming. The last of the seven sets of programming blocks located on the Common palette is the Switch block. The Switch block is a flow control block, just like the Loop. It is used to provide your programs with the ability to select from two sets of paths based on the evaluation of a specific condition. The Switch block is highly configurable, the picture shows how the Switch block looks when initially added to a NXT program. By default, the Switch block is configured to evaluate the data collected from a touch sensor. For programs where we use the Switch Block go to Light Sensor Programming or Color Sensor Programming.